Five people were shot dead and more than 20 injured, most suffering gunshot wounds, when military police officers opened fire with AK-47 assault rifles during clashes with protesters armed with stones, sticks and crude Molotov cocktails on Veng Sreng Street in the heart of the garment factory zone in Phnom Penh’s Pur Senchey district on Friday. Local rights group Licadho said the killings represent “the worst State violence against civilians” in 15 years, and is the single worst incident ever to hit the country’s key garment industry, which employs some 600,000 people in hundreds of mostly foreign-owned firms. The deaths and injuries cap more than a week of mostly peaceful protests as tens of thousands of garment factory workers have gone on strike to press their demands for a wage of $160 per month. Violence in the Veng Sreng Street area erupted late Thursday night when youths reportedly blocked roads and set fire to car tires in apparent retaliation for the beatings and detentions of 15 strikers, union leaders and monks by members of the paratrooper 911 Brigade at the Yakjin garment factory, also in Pur Senchey district. Hundreds of police and military police tried to quell the unrest at 2 a.m. on Friday morning but were unsuccessful, Licadho said in its statement, adding that up to 2,000 “mixed security forces” had gathered in the area by the time shooting broke out around 10 a.m Friday. From early in the morning, hundreds of young men stood behind make-shift barricades in the middle of Veng Sreng Street, which they had made from wooden market stalls and metal street signs, and from where they hurled stones at the military police. Many of the rioting youths had crude Molotov cocktails, though none appeared to hit the military police lines. Around 9 a.m., two military helicopters flew over the protest site, which were followed at 9:30 a.m. by hundreds of military police officers who marched in to confront the protesters near the Canadia Industrial Park, the epicenter of the clashes. Under a barrage of stones thrown by more than 100 protesters, the military police opened fire around 10 a.m., shooting hundreds of bullets at the demonstrators, including firing at the upper balconies of buildings where protesters were standing and hurling objects. Orders to open fire on the demonstrators were clearly audible to witnesses. “Striking workers launched rocks and Molotov cocktails toward military police, who retaliated by opening fire into the crowd,” local rights group Adhoc said in a statement Friday. “This resulted in the killing of five people: Yan Vathy, 23, from Prey Veng, who was shot in the stomach; Kim Pallin, 28, from Phnom Penh, and three other unidentified men. One of the three unidentified casualties, who was shot in the back, was transported to Wat Tuol pagoda around 12 p.m. Fifteen people were arrested and more than 20 suffered injuries,” Adhoc said. Shortly after the military police opened fire, Cambodia Daily reporters at the scene witnessed unconscious youths covered in blood being driven at high speed to hospital on the backs of motorcycles and slumped in tuk-tuks. Half a dozen wounded people were seen having bullet wounds to the legs, arms and shoulders tended to at a market stall selling medicine. Rocks, burning barricades, palls of smoke and spent bullet casings were strewn around Veng Sreng Street in the vicinity of the industrial park, as well as puddles of blood where the most grievously injured demonstrators were shot. After the shooting, the demonstrators turned their anger on the local Ekreach Clinic, which they accused of refusing to treat the shot protesters, forcing their way inside and smashing its windows, doors, and torching beds and other medical equipment in a bonfire on the street outside. Several shipping container trucks commandeered by the protesters were also parked across Veng Sreng Street. Sporadic shooting by the military police continued through mid-day as groups of dozens of youths, armed with sticks and steel bars, continued to hurl stones at the police lines, and burn pallets, wooden benches and sun umbrellas looted from the small market areas in front of the Canadia Industrial Park. Around 1 p.m., with reinforcement streaming in on the side of Veng Sreng Street held by military police, about 30 of what appeared to be elite military police officers, armed only with assault rifles, moved in behind the protesters throwing stun grenades, tear gas canisters and firing on full-automatic, above the heads of the stone throwers. Late on Friday evening, with several hundred armed military police stationed in the Veng Sreng area, the authorities used loudspeakers to order residents and civilians to stay off the streets, warning that anyone straying onto the street was doing so because they were “extremists” and would be dealt with accordingly. Despite the warning and massive military police presence, hundreds of people hung around in the side streets off Veng Sreng and amid the warrens of crude workers’ accommodation in and around the factories in the area. “We call on authorities to conduct thorough, prompt, fully independent investigations into all recent incidents of excessive use of force, including who ordered the use of live ammunition and the extent to which force used was proportionate to the threat posed,” Licadho said. Major General Rath Srieng, commander of the Phnom Penh Municipal Military Police, declined to comment on the number of protesters killed by military police, and would not comment on injuries sustained by his own personnel. National Military Police spokesman Brigadier General Kheng Tito said it was the municipal military police who were involved in the clashes on Veng Sreng and declined to comment further. National Military Police Commander General Sao Sokha could not be contacted for comment. In a two-page statement on Friday, the Ministry of Defense said that the Royal Cambodian Armed Forces (RCAF) is committed to protecting Prime Minister Hun Sen, and July’s election results, which returned a slim win for the long-ruling CPP, whose senior members fill the ranks of the defense ministry and RCAF. Several independent election monitors and the opposition party say the election was riddled with voter irregularities and, as a result, did not fairly reflect the will of the Cambodian people. 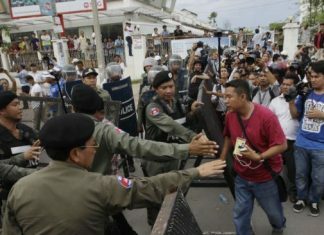 The Cambodia National Rescue Party, which won 55 seats to the CPP’s 68, has boycotted parliament to demand an investigation of the election, and has mounted almost daily street protests since December 15 to demand a new election, and the resignation of Mr. Hun Sen.
“The Royal Cambodian Armed Forces declares its commitment to protect the nation, religion, King, and particularly the Constitution, and the outcome of the election that came from the majority will of the people, and in any circumstance, especially, support the leadership of [Prime Minister] Hun Sen,” the ministry said in an unsigned statement. “Those rioters began destroying state and private property, and they shouted and intimidated other workers working peacefully at the factory,” Mr. Siphan said, explaining the need for lethal force. “It has been a few weeks and the government did not use the armed force because the government didn’t want to see violence, but the rioters forced us to run out of patience since they attacked our forces with rocks, sling shots and threw bottles filled with gasoline,” he said. Asked who was responsible for the shooting dead of the five protesters, Mr. Siphan said: “the inciters,” referring to the political opposition. Ken Loo, secretary-general of the Garment Manufacturers Association in Cambodia, said the deaths and injuries were not the responsibility of factory owners, speculating also that the dead and injured were probably not even factory workers. “I believe they are not garment workers,” Mr. Loo said. “The [security] forces have a duty to protect society and investors. If the factories’ properties are damaged, who will be responsible for the damage?” he asked. Mr. Loo also rejected the idea that Cambodia’s international reputation will suffer as a garment producing country. “No. It will not affect the reputation since the factories are not the persons who shot at those people,” he said. At the Khmer-Soviet Friendship Hospital where three of the protesters died or were admitted dead, 22 injured people were also treated for gunshot wounds. Nineteen of the injured said they worked in garment factories. Four of the 19 were women, including Teav Rady, 20, who was shot twice. “A bullet grazed my chest and I was shot in the left arm,” she said from her hospital bed. Prum Phearum, 22, was shot in the side and was in a serious condition late Friday evening, doctors said. “We didn’t have guns…. 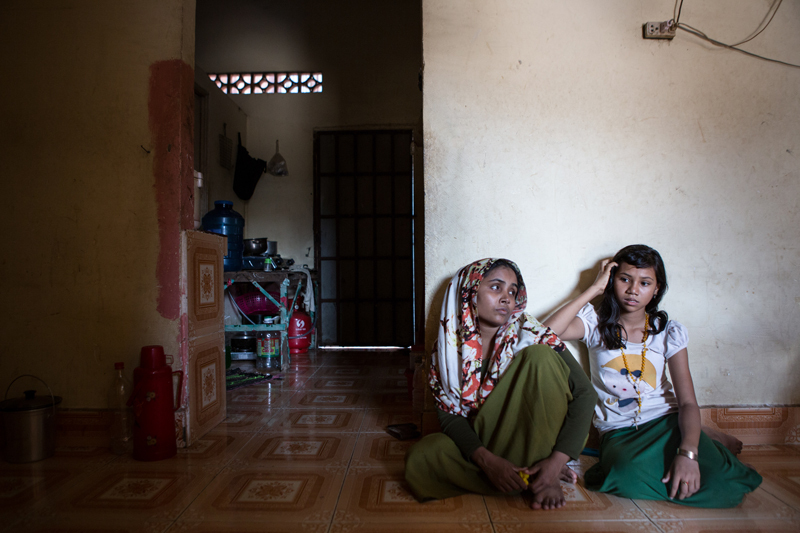 Why did the military police shoot?” asked Sou Sambath, 20, whose leg was grazed by a bullet. Chiv Sary, 28, the sister-in-law of slain protester Yan Vathy said she was shocked too that the military police used bullets against stones. “The military police should not behave like this: using guns to suppress workers. Why didn’t they just use their batons?” she asked. The Ministry of Labor issued a statement in the wake of the violence, claiming that most workers were happy with its offer of $100 per month. The ministry also blamed the violence on incitement by the five, non-ruling party aligned, unions that have led the strike action, as well as the CNRP. CNRP President Sam Rainsy called on Friday for an immediate stop to the violence. “I am very sorrowful after receiving information that today there was bloodshed between Khmer and Khmer at Canadia Industrial Park,” Mr. Rainsy said in a video clip posted to his Facebook page. “It was a serious clash between striking workers and armed forces who are under the command of government,” he said. “I call for both sides to retreat in order to end the violence immediately,” he added. The U.N. issued a statement late Friday saying that it was following the events in Phnom Penh. “We urge all parties to show maximum restraint. We condemn the use of live fire against workers and demonstrators in the strongest terms, as well as the violent actions taken by some individuals in the course of demonstrations,” the U.N. said.